The Township of Wright was established in 1847. Settlers had been coming to the territory of Michigan before it became a state in 1837. Henry and Mary (Omlor) Host came to this wooded area in 1844 from Ohio. Soon after, Mary's sisters, Margaret (Omlor) and her husband, Jacob Finkler, along with Catherine (Omlor) and her husband, Anthony Armock, came to life and farm South and North of the Host family respectively. Their brother, William and Rosa (Uhl) Umlor, came to farm West of his sisters. They thought this area would be very good for farms in what is now the village of Wright. ​It didn't take long for these families to have neighbors and establish the parish of St. Joseph, Wright. These families included: John and Margaret Dohm, Joseph and Mary (May) Heist, Marcus and Josephine (Hoffman) Alt, Joseph and Mary (Frisch) Kluting, Joseph and Elizabeth (Gerber) Dietrich, Anthony and Mary (Heitz) Klein, Adolph and Mary (Kaltz) Rasch, Jacob and Barbara (Olmlor) Brown, Joseph and Elizabeth (Braun) Bauer, Jacob and Mary (Umlor) May, John and Mary (May, who died young), then second wife, Elizabeth (Schneider) Umlor, Anthony and Mary Anna (Heitz) Klein, Frank and Mary (Hoffman) Robach, Peter and Mary (Fritz) Zahm, Pete and Catherine (Heist) Miller, Lorenz and Barbara (Host) Courtade and two Zimmer Families, Nicholas and Elizabeth (Schwartz) Zimmer and Nikolas and Mary Zimmer. From the book, "The Catholic Church in the Grand River Valley," it is said that Fr. Viscosky visited settlements, said Mass and preached to the settlers. This Hungarians priest visited much of Western Michigan and "Sowed the seeds of faith when all about was wilderness." St. Joseph's records began in 1855 with Fr. J. Maciejewski recording baptisms, marriages, and funerals. The Diocese of Detroit officially instituted the parish of St. Joseph on All Saints Day, November 1, 1863. Before a log cabin church was built, these families met in each other's homes to pray. A simple wooden structure served as a church, rectory and school until 1869 when a second large, tall-steeple church building was builder under the direction of Fr. Rhode. As early as 1865 classes for the parishioner's children were held in the rectory. Later, the basement of the church was used. 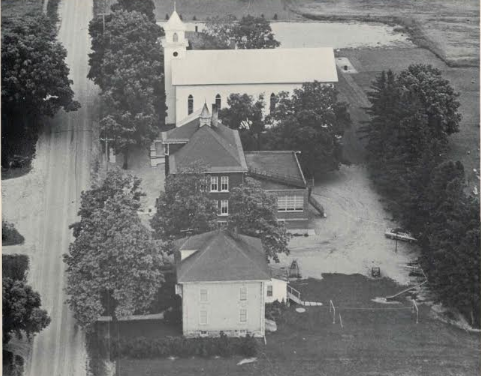 A wood frame building, south of the Church, was built with two classrooms in 1865 and in 1887, the Sisters of Mercy came to teach at St. Joseph's school. They were followed by the Sisters of St. Dominic, from Grand Rapids in 1893. As noted by Fr. Ege that same year, "During the past year, the school was enlarged. The improvement is of advantage to teachers and scholars. The addition to the school cost $400. Another improvement was a new wind-mill. It furnishes water for the parochial residence, school house and barn." 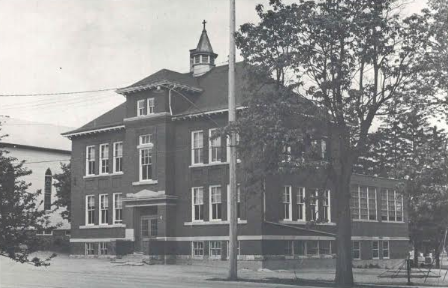 In 1910, a new, red-brick school was built. In 1955, two more classrooms were added to the school building. Then in 1990, this school building was totally renovated. ​In 1973, the present brick church was built and was renovated in the year 2000.